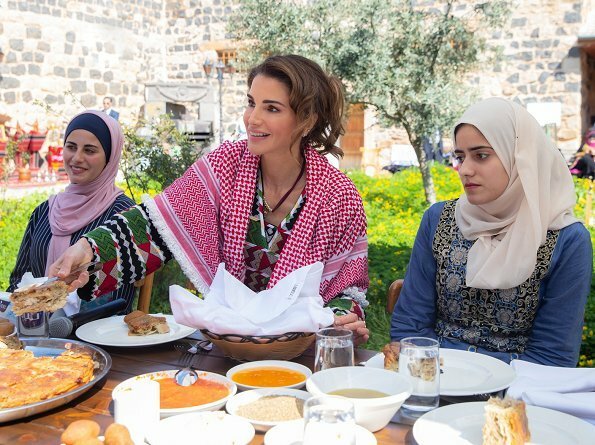 Queen Rania met with members of Muhafazati Volunteering Foundation in Irbid. The Queen thanked youth volunteers for working hard to create lasting impact in their communities. Muhafazati Foundation is a non-profit organization which aims to empower young people in Jordan and to promote active citizenship. Muhafazati promotes young people’s involvement in volunteering and awareness-building activities and helps them become active and socially conscious members of society. Established in 2014, Muhafazati has implemented several other projects in Irbid and across the country, including book-gifting and anti-littering campaigns, charity drives, skill-building projects to help young people in Jordan secure employment, and an awareness-building project on the dangers of extremism. Muhafazati’s latest project was launched last summer. The project aims to increase social media literacy and promote responsible use of online platforms. Ooo I LOVE her hair! She looks so young with it, and so fresh and beautiful! Very pretty! I love everything here, she is always her very best when wearing traditional dresses. I completely agree with the positive comments. 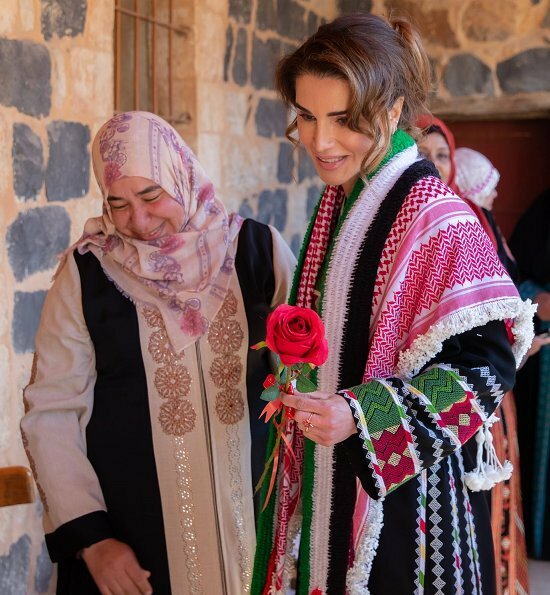 I admire her that she wears traditional fabrics and designs so often; some of her outfits may look a little off-centre sometimes, but I suspect they might have been designed and constructed by local designers whom she supports by wearing their clothes. She is a beautiful, strong, intelligent woman (have you heard her speak at conferences? very inspiring) and she looks great here. Excellent thoughts, and I agree. Q Rania looks wonderful,hair and dress. Me encanta el traje típico y sobre el :el símbolo de hombres del desierto"